This is an election year in France (please click) and WordPress author “Becoming Madame” has published an essential post on the subject. I have to let you know about this post. 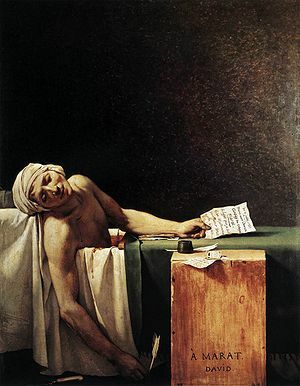 Jean-Paul Marat (24 May 1743 – 13 July 1793) was a “radical voice.” He escaped the guillotine, but was killed by Charlotte Corday on July 13, 1793. He was working in his bathtub where he found relief from a debilitating and itchy skin disease, probably dermatitis herpetiformis or Duhring’s disease, not caused by the herpes virus. Easily, the article is actually the greatest on that worthy topic. I agree with your conclusions and also will certainly eagerly look forward to your forthcoming updates. Saying thanks will not simply be sufficient, for the fantasti c clarity in your writing. I can correct away grab your rss feed to stay privy of any updates. Admirable work and much success in your business endeavors! salutations from over the world. interesting post I will return for more. salutations from across the ocean. interesting post I must return for more. Good, your article is often the sweetest on this particular special matter. I just match up with together with ones findings along with could certainly thirstily await your getting close to tweets. Merely indicating thanks do not merely be all you need, for any fantasti do lucidity inside your writing. I will most certainly instantaneously get your own feed to be knowledgeable from a messages. Wonderful job and likewise quite a bit success in your own business efforts! Wow, superb blog layout! How long have you been blogging for? you made blogging look easy. The overall look of your website is great, let alone the content!. Thanks For Your article about An Election Year in France: a Link to a WordPress Post Micheline Walker's Blog . This was incredibly instructive. Maintain up with good posts.It truly is such as you can study my head. thanks a whole lot. Hi my loved one! I want to say that this post is amazing, great written and include almost all vital infos. I would like to see more posts like this . Thank you for sharing this wonderful blog.